Bring new life to your home and outdoor spaces with ever stylish and always practical outdoor blinds. Australian Outdoor Living will custom make a range of outdoor blinds, with both café and shade blinds available. If you’re looking for inspiration as to how outdoor blinds can transform your home, check out the current trends we’re seeing in outdoor design! 5 Outdoor Blind Design Ideas to Inspire Your Outdoor Space. Okay, so we realise this isn’t an example of a home with outdoor blinds, but we really felt this image was worth including because here, tinted café blinds, hung with pendant lights create a beautiful design feature with use of line and repetition to make the space feel longer. This look and feel can also be mimicked at your house! The reflective surface of the blinds, which is practical for both privacy and keeping out the heat, also makes the space look larger and builds on the colours in the furniture and plants. At Australian Outdoor Living we do love our roller shutters and the benefits they provide to our homes, however outdoor blinds also make a perfect window covering to protect your home from the harsh Australian sun and cut your energy costs. The slick look of these dark grey blinds mean that the view of the pool is maintained from the inside and the blinds blend beautifully with the sharp design of the home and the pool. Sleek and modern window coverings. 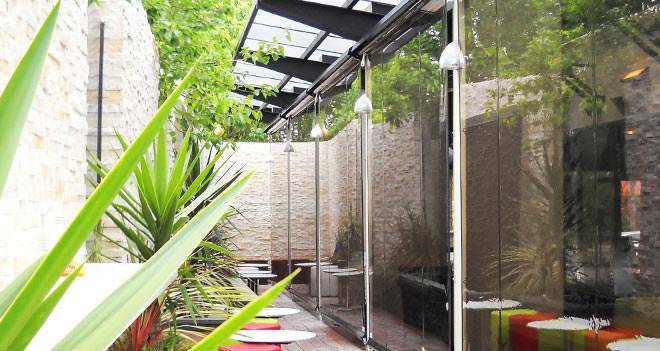 Create definition between your outdoor spaces with opaque blinds that act as retractable walls. These are great for entertaining large groups, such as birthday parties, and extending the indoor spaces in your home, practically creating another room. Opaque blinds can double as a projector screen when you’re entertaining so you can share videos and happy snaps with all of your friends and family on a large screen! You can completely change the look and feel of your outdoor space depending on the colour of your blinds. 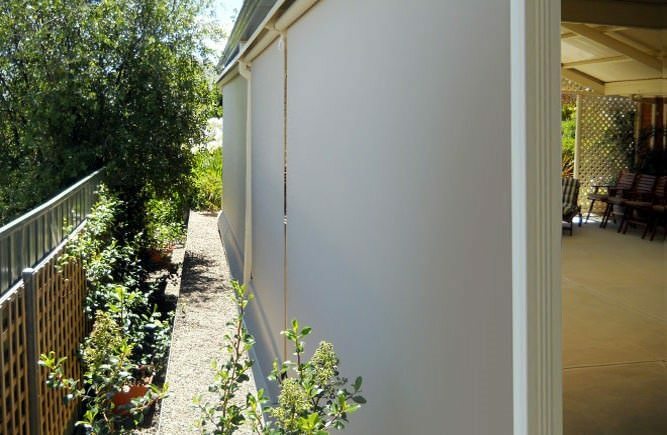 At Australian Outdoor Living our shade blinds come in 12 different colours depending on your design goals. We love the warmth created by the deep yellow shade in these blinds, which are perfect to keep the area cool and shaded without sacrificing the look and feel of natural sunlight. If you’re ready to explore your options and get your outdoor blind installation underway, view our full range of outdoor blinds or get in touch with us for a no obligation free measure and quote!